This article explains some of the common causes of shoulder pain, as well as some general treatment options. Dr van den Berg can give you more detailed information about your shoulder pain. On top of the shoulder: May be caused by acromio-clavicular (AC joint) problems (AC Joint Degeneration and AC Joint Dislocation). At the back of the shoulder: Possibly Arthritis of the shoulder. In the neck and upper part of the shoulder: May be caused by referred problem from the neck. In the neck, shoulder and radiating down the arm into the hand: Consider neurological problems like disc problems in the neck or Thoracic Outlet Syndrome. When do I get the pain? 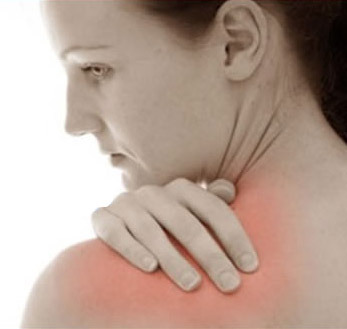 Shoulder pain during the night: Pain at night occurs with most shoulder problems. Usually shoulder instability does not affect sleep but most other conditions do when a person lies down at night. The reason is that any inflammation is worse when the position of the structure is lower due to the pressure effect of gravity – in the upright position the shoulder is elevated. Constant or intermittent pain of the shoulder: Most mechanical reasons for pain e.g. 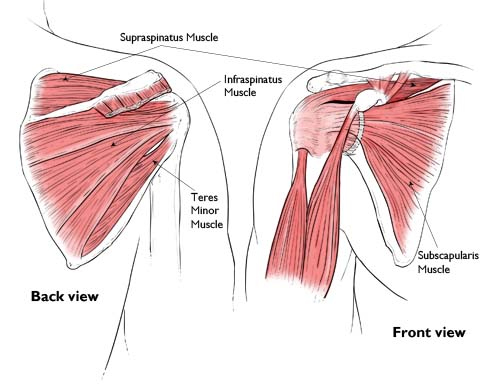 Rotator Cuff Tears, mostly cause pain with certain movements like lifting the arm. On the other hand certain conditions cause constant pain unrelated to movement – these would be pain from nerve conditions like referred from the neck or Thoracic Outlet Syndrome. Acute “blinding” pain usually occurs with calcific tendonitis when the calcium is being absorbed. Other conditions may cause intermittent pain depending on position of the arm and the activity. If the pain is constant and running from the neck down to the shoulder and hand it is most likely from a nerve problem in the neck or thoracic outlet. 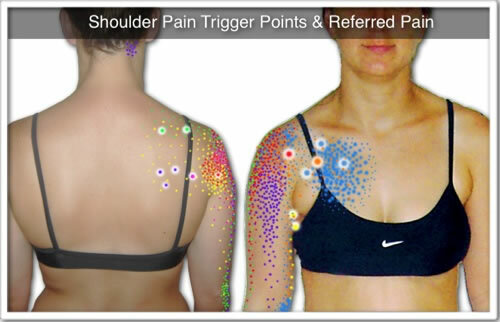 If the pain is more mechanical (occurring with movements only) it would suggest a damaged structure in the shoulder. Acute: Excessive overhead activities during work or sport (such as ball throwing or tennis) can lead to acute tendinitis. Chronic: Degenerative diseases like arthritis or repetitive wear and tear due to age, can lead to chronic tendinitis. The most commonly affected tendons in the shoulder are the four rotator cuff tendons and one of the biceps tendons. The rotator cuff is made up of four small muscles and their tendons that cover the head of your humerus and keep it in the shoulder socket. Your rotator cuff helps provide shoulder motion and stability. 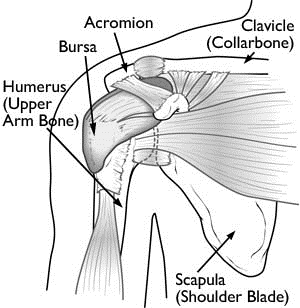 Shoulder impingement occurs when the top of the shoulder blade (acromion) puts pressure on the underlying soft tissues (bursa and rotator cuff) when the arm is lifted away from the body. As the arm is lifted, the acromion rubs (“impinges”) on, the rotator cuff tendons and bursa. This can lead to bursitis and tendinitis, causing pain and limiting movement. Over time, severe impingement can even lead to a rotator cuff tear. Shoulder instability occurs when the head of the humerus is forced out of the shoulder socket (glenoid). This can happen as a result of a sudden injury or from overuse. Shoulder dislocations can be partial, with the ball of the humerus coming just partially out of the socket (called a subluxation). A complete dislocation means the ball comes all the way out of the socket. Osteoarthritis may be related to sports or work injuries and chronic wear and tear. Other types of arthritis can be related to rotator cuff tears, infection, or an inflammation of the joint lining. Shoulder fractures commonly involve the clavicle (collarbone), humerus (upper arm bone), and scapula (shoulder blade). Shoulder fractures in older patients are often the result of a fall from standing height. In younger patients, shoulder fractures are often caused by a high energy injury, such as a motor vehicle accident or contact sports injury. Fractures often cause severe pain, swelling, and bruising about the shoulder. X-rays: These pictures will show any injuries to the bones that make up your shoulder joint. Magnetic resonance imaging (MRI) and ultrasound: These imaging studies create better pictures of soft tissues. It may help your doctor identify injuries to the ligaments and tendons surrounding your shoulder joint. Computed tomography (CT) scan: This tool combines x-rays with computer technology to produce a very detailed view of the bones in the shoulder area. Electrical studies: Your doctor may order a tests, such as the EMG (electromyogram), to evaluate nerve function. Arthroscopy: In this surgical procedure, your doctor looks inside the joint with a fiber-optic camera. Arthroscopy may show soft tissue injuries that are not apparent from the physical examination, x-rays, and other tests. In addition to helping find the cause of pain, arthroscopy may be used to correct the problem. Activity Changes: Treatment generally involves rest, altering your activities, and physical therapy to help you improve shoulder strength and flexibility. Common sense solutions such as avoiding overexertion or overdoing activities in which you normally do not participate can help to prevent shoulder pain. Medication: Your doctor may prescribe medication to reduce inflammation and pain. If medication is prescribed to relieve pain, it should be taken only as directed. Your doctor may also recommend injections of local anaesthetics or steroids to relieve pain. Surgery: Surgery may be required to resolve some shoulder problems; however, 70-80% of patients with shoulder pain will respond to simple treatment methods such as altering activities, rest, exercise, and medication. Certain types of shoulder problems, such as recurring dislocations and some rotator cuff tears, may not benefit from exercise. In these cases, surgery may be recommended fairly early. Surgery can involve arthroscopy to remove scar tissue or repair torn tissues, or traditional, open procedures for larger reconstructions or shoulder replacement.